The Econ-O-Dry is a great when paired with the Econ-O-Wash top load washers. This machine has single load or stacked double load capacity. It is easy to use and dries laundry fast. The Econ-O-Dry is also available in gas or electric. The Econ-O-Dry has an oversized door opening allowing for easier loading and unloading. 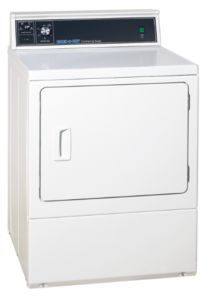 The cylinder capacity takes on larger loads of laundry and provides improved tumble action through axial airflow technology, moving air more evenly through laundry items to get them dry faster. Designed for minimal maintenance and simplified serviceability. The lint filter can easily be cleaned. From the front of the machine most components can be accessed. From the lower front panel the motor, blower, heating element, gas valve and thermostats are all serviceable without having to disconnect the door switch. The Econ-O-Dry has double the drying capacity using half the space. The commercial dryer stack model offers two individually operable, single-pocket tumblers in one of the narrowest cabinets available (26.875 inches wide). This allows laundries to maximize space and productivity. The Econ-O-Dry offers fabric selection options including delicate, permanent press, no heat and normal, and an indicator light that illuminates when the machine is in use. A timer enables the user to manually select dry time according to load type and size.